← The 2012 International Food and Wine Festival is coming back to Herzog Cellars in August! If you have never heard of Natural Wine than you must be friend’s with the newest Geico Ad Pitchmen that live under a rock! The only real issue with Natural wine is – there is NO clear answer to the question – What is Natural Wine? If you want to know what kosher wine is – my posting and others clearly delineate the rules and laws that define kosher wine. I loved the way that both Peter Hobbs and Eric Asimov described Natural Wines, simply stated, wine that is created with nothing added and nothing removed. Still, as simple as that sounds, no one talks about the actual rules inside the winery and no one talks about the rules outside the winery. Can you sulfate the vines, many say yes and many say no. Clearly you cannot sulfur the wine with SO2, as that would be adding to the wine. However, throughout all the clamoring, some things come out loud and clear – natural wine is wine with all of its warts and beauty, with its romanticism, and with all of its nice and ugly sides. In other words, no matter how hard the romantics attempt to spin natural wine, it is still wine that can be great or horrible. I loved the descriptor used for one natural wine; burnt rubber and barn floor. Also, natural wine is being touted as something other than wine, in both the trade and on menus throughout the world, which is a mistake. 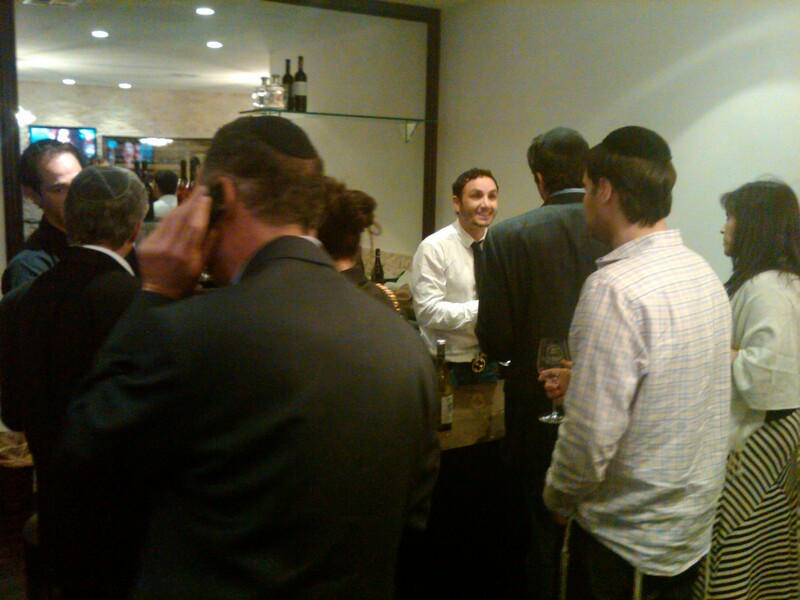 Look at kosher wine, kosher is trying its hardest to rid itself of the kosher moniker and sell itself as wine – period, with the attribute, that it is kosher. Personally, by attempting to set itself aside and make itself different, the natural wine producers are doing themselves a disservice. They are unconsciously placing the idea in people’s minds that natural Cabernet Sauvignon, is not a Cab – but rather a natural wine. This is a serious mistake and one I hope that Alice Feiring and the rest of the Natural wine Joan of Arcs will fix soon. In no way am I saying natural wine should not be appreciated and in some cases revered. All I am saying, is what Alice Feiring herself states in her book, Naked Wine. Naked wine is wine stripped down to its basics—wine as it was meant to be: wholesome, exciting, provocative, living, sensual, and pure. 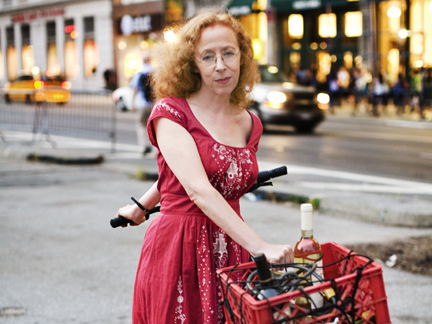 Naked, or natural, wine is the opposite of most New World wines today; Alice Feiring calls them “overripe, over-manipulated, and overblown” and makes her case that good (and possibly great) wine can still be made, if only winemakers would listen more to nature and less to marketers, and stop using additives and chemicals. But letting wine make itself is harder than it seems. There you have it, still no clear rules of what Natural wine is or is meant to be, however, it is a wine in its purest state and one that is crazy difficult to make, given the few rules that are clearly stated – i.e. NO manipulation or addition of any sort. One may think, so what how hard can it be to make wine with no additives or manipulations? Well, simply stated its like trying to take a perfectly white wedding dress, exposed to the elements, with you to work and then back on the subway. Unless you are overly conscientious throughout the entire ordeal that wedding dress will be ripped, torn, and sullied in a matter of no time. Why? Because it is nature’s way to make what it wants with your dress – if you leave it open to the environment. When winemakers make wine today, they do their best to keep nature out of the picture! 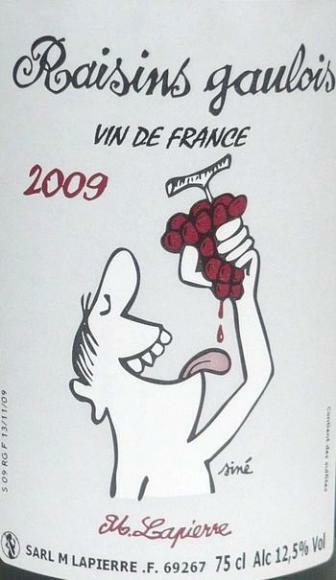 They dump sulfur into the wine quickly to keep away the bacteria that wishes to turn their wine must into a petri dish. After that they have a not so natural clean slate with which to do what they want with it! Without this chemical sheath, the wine must would be open to the subway environment called bacteria, even in state-of-the-art wineries, you cannot keep mother nature away. That is not to say that natural yeasts cannot still come alive, after the SO2 application, and ferment the wine must, but that is to say, that the wine has been manipulated and changed its flavor profile, if you have a palate like Feiring. Covenant Winery uses natural yeasts but uses SO2 of course. Jeff Morgan, like many others, think SO2 in wine is like personal hygiene – keep out the bacteria and the other nasty critters that make a wine maker’s life a misery! Without SO2, the effort curve it takes to make a very good wine becomes elliptic rather than linear. Every action within the winery, in regards to the wine, must be done with a conscientious knowledge that the wine is not protected. One example, that Richard Harkham (wine maker of Harkham winery) explained to me was the simple act of pumping air into a tank during a racking sequence, is analogous to shooting a human up with an air bubble – absolute and complete death! Why? Without molecular or ionized SO2 to bind to the air and its cohorts – the wine can has a far larger opportunity to turn brown or worse, into VA. So, to make a fantastic wine that is also natural, takes a far more studious and careful wine maker – one passionate for the sake of the wine and its customers. With this as the backdrop, I was lucky this past week to drive down to LA and meet Richard Harkham, the part owner, and winemaker of Harkham Winery. We first found out about this winery when on vacation in Australia! The story on how we found the Harkham Winery, when in Australia is awesome, so check it out! Since then, we have enjoyed Harkham wines in the past two weeks. 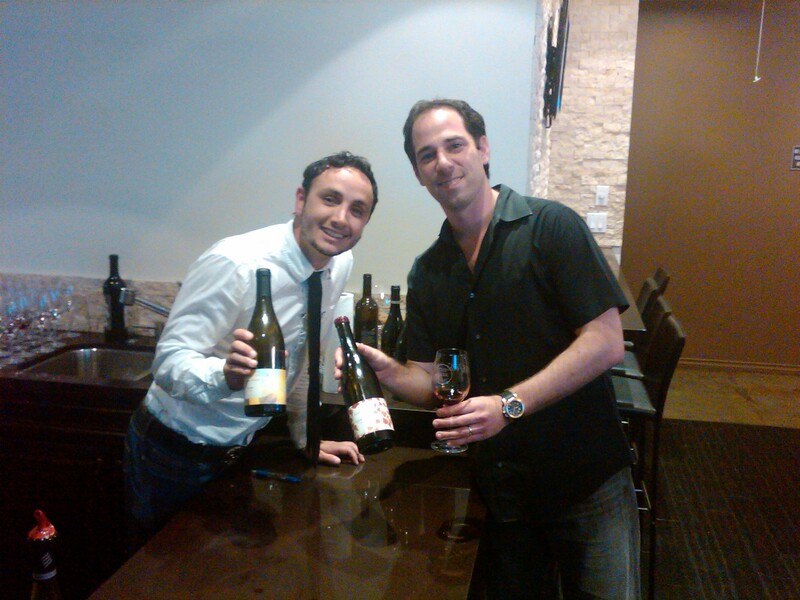 Last week we enjoyed the 2009 Harkham Aziza’s Shiraz and two weeks ago we enjoyed the 2010 Harkham Chardonnay. So when I heard from Richard, via email, that he was in the area I knew it was far from a coincidence, so much so that it compelled me to drive 400 miles to join him at the tasting at the fantastic wine store in LA, The Cask! The wine event was wonderful and it was a rare opportunity for people in the US to get a chance to taste what I have been tasting now for two years. Royal wines has been importing wines from Harkham for two years now, the 2009 Harkham Shiraz, and now the 2010 Harkham Chardonnay and the 2010 Harkham Merlot/Cabernet blend. The wines are nice and are mevushal as well, but the crème de la crème, never leaves the island of Australia. The Aziza’s Shiraz that I have enjoyed these past couple of years stays in the land of it creation, which to me is a real shame. Harkham wines have been receiving accolades from all around Australia and the world, for their quality and value! The kosher symbol had nothing to do with that! The 2011 Harkham Aziza’s Chardonnay, which has no added preservatives, was equally loved by world-famous wine critic Jancis Robinson, she chose it as the second best Chardonnay in her tasting of the top Chardonnay wines of Australia! Further, Andrew Jefford recently tasted the 2011 red wines and had the same experience that I had; though his eloquence far exceeds mine, excerpting from his blog; I recalled the two explosively energetic 2011 Shiraz wines I had tried a few days earlier from Harkham, also in the Hunter: the 2011 Preservative Free Aziza’s Shiraz (imagine crushing a bunch of grapes in your hands and having the juice ferment between leaving your fingers and falling into your mouth) and the beautifully extracted, lingeringly deep 2011 Old Vines Shiraz: sloes and volcanoes, unsullied by oak. 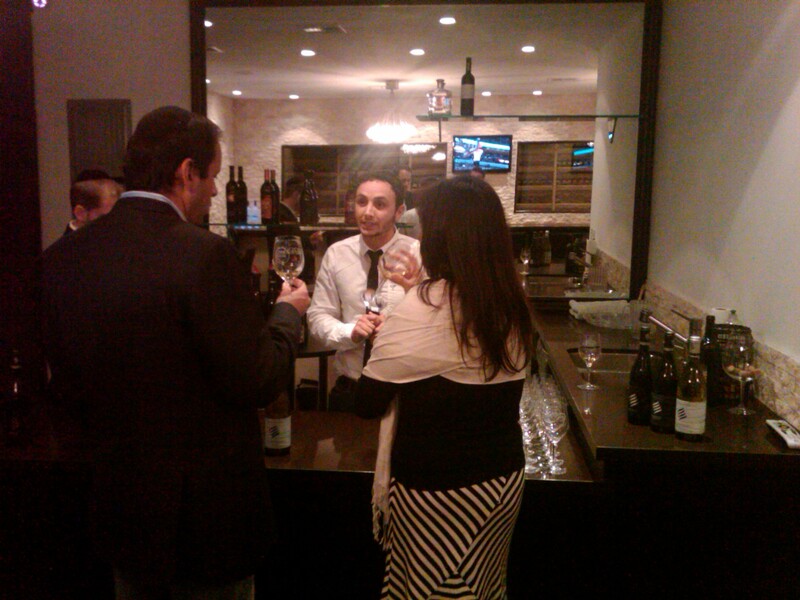 So with all the deserved scores and notes I looked forward to the wine tasting! 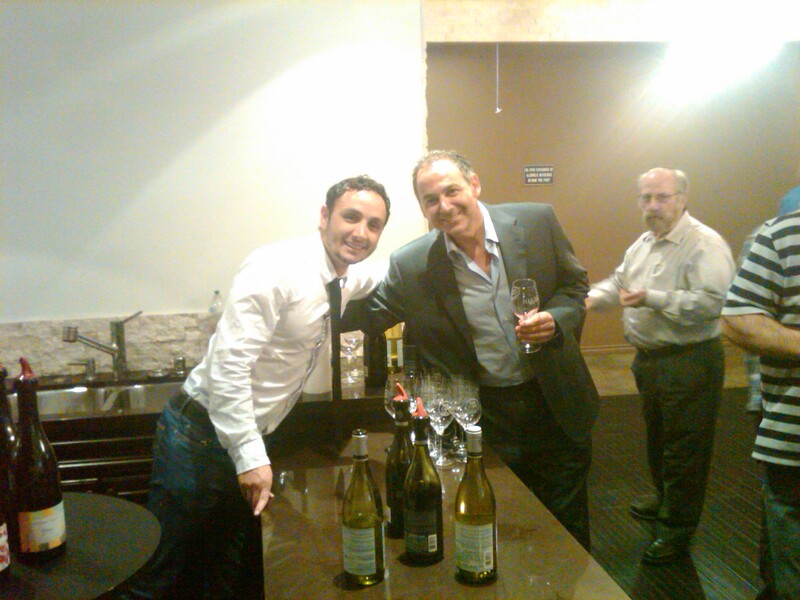 Harkham winery is the only kosher winery in Australia. Please note that I did not say it was the only kosher wine in Australia, that would be very incorrect. However, it is the only winery which only makes kosher wine and it is the only winery that makes kosher wine in the famed Hunter Valley. Harkham is creating unique wines with a natural philosophy. Since the Richard and his family took over the estate in 2005, they have upgraded the facilities and taken an exciting new direction. Their diverse range is made from hand-picked and hand-sorted fruit. The winery focuses on small batches of fruit selected predominately from hillside vineyards in the Hunter Valley. Minimal handling, bottling without filtration, the sole use of French oak and low levels of preservatives are just some of the techniques used by Richard and the winery. Through the 2009 season, the Harkham Winery worked closely with a passionate Burgundian-trained winemaker Christian Knott to create these new wines. After the 2009 season Christian moved back to Burgundy, and ex-Vaucluse Cellars man – Mr. Jayd Smith, who now lives in Perth, has been working with Richard to perfect the wines in his portfolio. The story about how the current incarnation of the Harkham Winery started, is in my original article on the Harkham Winery. Also, the young man in the article, who sold me the bottle of the 2009 Harkham Aziza’s Shiraz, was none other than Richard’s brother! When the winery started in 2005, it was not kosher and they produced 3 thousand or so bottles from the winery’s 6 or so acres of vineyards. In the following two years nothing much changed, excepting for the addition of Christian. Starting in 2007, Harkham started on an improvement process, involving the winery itself, the wine portfolio, and the winery staff. Christian’s presence was helpful in allowing Richard to create his first award-winning Shiraz in 2007. In 2008, the winery turned kosher, producing 4 thousand bottles and has never looked back. In 2009, unfortunately Richard’s grandmother passed away. She was the family’s matriarch who lived in Israel. She arrived to Israel in 1929, and soon thereafter took up residence in Zichron Yaakov, where she had a vineyard and made natural wine. The wine and food on her table was the central nervous system for the family, where they met and enjoyed each others company. 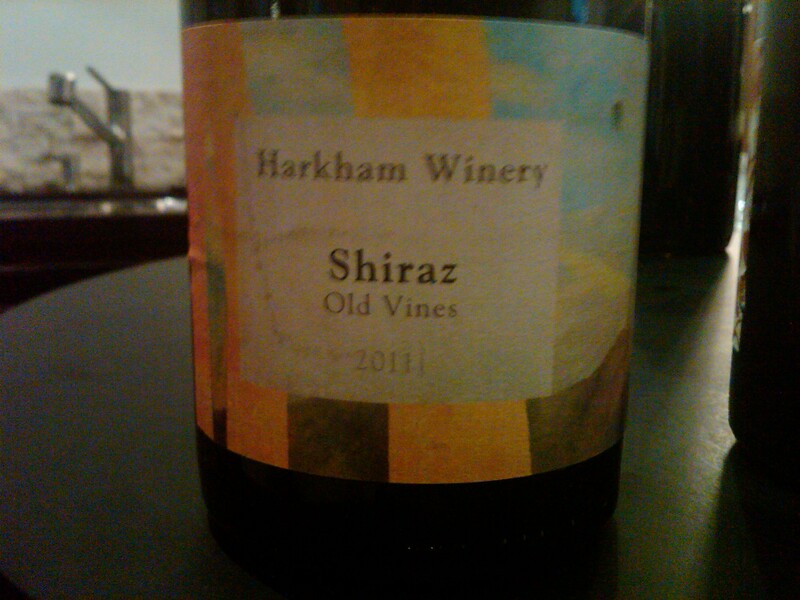 Harkham started to improve the winery facility and added the highly acclaimed Aziza’s Shiraz. The vineyard from which they source the Aziza’s Shiraz, is on the top of a southeastern facing slope, in the coolest area of Hunter’s Valley, which allows for the grapes to reach their maximum ripeness without losing their acidity. In memory of his grandmother and because she also made natural wine, Richard named his preservative free/natural wine after her name. They produced 5 thousand bottles, of the inaugural Shiraz wine, that year and they also started a wonderful relationship with Royal Wines. Richard produced 10 thousand bottles of Shiraz using the mevushal process. The 2009 Harkham Shiraz, is imported by Royal into the US, and was the only wine available in the US from Harkham until earlier this year. It is a wine that some have liked and some have found very country-style and slightly cooked by the mevushal process. Following their largest expansion in 2009, Harkham expanded further in 2010 by producing some stunning wines in the shape of a new Aziza’s Chardonnay and a Harkham Select Shiraz, on top of the existing Harkham Aziza’s Shiraz, and a pair of new wines for Royal; the 2010 Cabernet/Merlot and the 2010 Chardonnay. The Cab/Merlot is a solid wine with tons of still searing tannin, but lovely green affectionate tones that make the Cabernet fruit stand out among the mounds of Merlot fruit. Quite a solid wine given its mevushal process, and it is a wine that is readily available all over the US. They also produced a Harkham Select, essentially the Harkham Shiraz Reserve, which is not mevushal, and may well be in the state someday soon. The Harkham Select is a uniquely expressive wine that is perfectly adapted for the American and world palate. The clear and present black pepper, heavy spice, and dark fruit are perfectly tempered by classical Australian floral notes and deep charcoal influences, that scream Australian, but a wine that is perfectly at home at a barbecue or an American Bistro, or your weekend table. 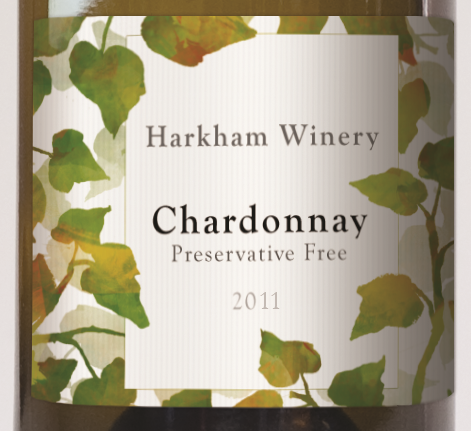 Finally, the 2010 Harkham Chardonnay is a nice example of a white mevushal wine that is not an oak bomb or a fruit bomb. Rather it is a staid but nice enough wine by itself. The 2011 vintage ushered in yet another mind-blowing wine that took my breath away and everyone else at the wine tasting. There is the 2011 Aziza’s Shiraz, the 2011 Aziza’s Chardonnay, and now there is the insanely intense aromas of the 2011 Harkham old vine Shiraz. To say I was mesmerized by the aroma would be an understatement, I stood there for 5 minutes simply smelling the wine and having no other cares in the world. The aromas screamed of the most intense ripe blueberry folded into a glass of ripe fermented red and black fruit juice squeezed by hand and blended to perfection. 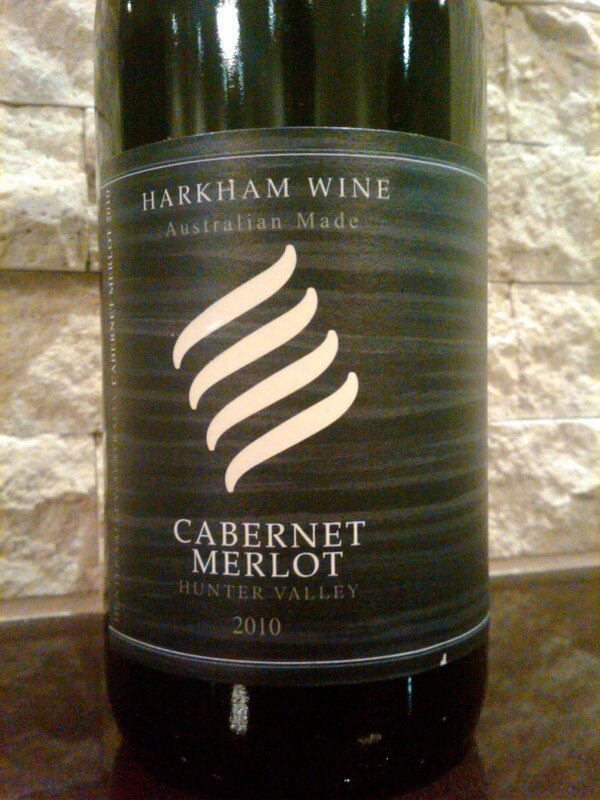 The 2011 vintage was a bumper crop for Australia and did well for Harkham producing some 40 thousand bottles, an almost two-fold increase. The 2012 vintage was an extremely wet summer and one that did not bring in the quality or quantity of fruit that Richard and Jayd were looking for, so though the crop is smaller, the hope is that what is missing in quantity is made up for in quality. Please remember that the 2012 season in Australia ends in March or April, at the latest, and so the 2012 season in the Southern Hemisphere is already in the bag/tank/barrel! Finally, an interesting and personal anecdote in the tasting, was getting the chance to compare wines with higher acid and SO2 added versus wines with lower acid and no SO2 added. The first three wines we tasted had zero to no manipulations of any sort, with their total acid clearly low and their pH higher than normal. The wines that followed those were clearly manipulated with acid and SO2, but still in a soft handed approach, which lifted the wine in a way that I was not expecting. When we taste SO2 wines one after the other, we lose sense of what the SO2 does. In many ways it acts very akin to MSG in a dish, resulting is a sense of exaggeration that I can only describe as a massive caricature head on top a pencil thin stick. Sadly, by the time I hit the fifth wine my senses had been dulled and I was back to my love for all things tart, acidic, and SO2’ed out of its mind. I almost went crazy, I felt like I was a mouse in a maze being manipulated by mass market wineries (no I am not a conspiracy freak). Crazy, I know, but clearly a feeling I hope everyone gets to experience, as it is eye-opening to say the least. 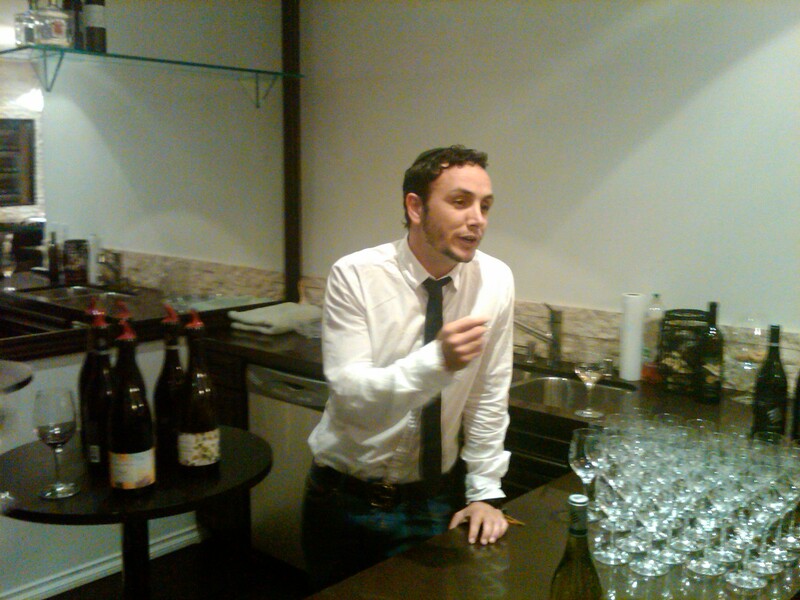 The tasting gave me a chance to see what all the hubbub is around Natural wine. Once I tasted the wine I could see why there is such a fanatical and romantic passion that surrounds natural wines and why people are flocking to them. Natural wines bare their soul for all to see, there is no clothing to cover up the ever so human faults, perceived or not, that trouble all wines. The wine is left open to the environment, to persevere through the troubles that we lay at its feet, along with the romantic notion that the wine is left open for voyeurs to see through its veil and understand it vulnerabilities. Its sweet and unhindered flavors are a rallying cry for the naturalists, and one that I can now maybe begin to understand. I hate writing notes about wine that is not readily available, but this is a wine worth seeking out, even if you must harass Richard or fly to Australia to taste it. I say this given its unique flavors and lack of manipulation, being preservative and additive free. This wine starts off very much akin to what Anthony Rose and Andrew Jefford point out, that being a clear funk and almost oxidized aromas, followed by violet, petrol notes, herb, hay, rich apple pie, and melon. The mouth is balanced and medium in structure with ripe summer fruit, rounding oak influence, lovely brioche, and enough acid to the trick. The finish is long with clear oak influence nice vanilla, butterscotch, ripe fig, and floral notes that hide the lack of acidity on the finish. Over time the wine loses its obvious funk and comes out to a rousing applause of butterscotch on the nose, more floral notes, Asian pear, green apples, and melon. The mouth opens and becomes rich with more summer fruit, brioche, along with baked and spiced apple. The finish is long and spicy with spiced fruit, butterscotch, rich vanilla, and good apple cobbler. The wine clearly is capable of escaping its funk and needs time to reach its potential. I would drink it now till 2014. However, if you do enjoy it now, take a quick taste upon opening and then leave it to air for an hour and watch it evolve in the glass. This is another wine that is extremely hard to get one’s hand on, as it is not yet imported into the US. Something I hope will be rectified sometime soon, though that is a prayer more than a hint, in any way. The nose on this Shiraz explodes with a super ripe nose of ripe blueberry, blackberry, blackcurrant, all wrapped up in an Australian unique bouquet of jasmine flowers and mineral or hay notes. The mouth on this medium bodied beauty evokes memories of older sibling (the 2009 Aziza’s Shiraz) with rich black and blue fruit, that is balanced with good oak and soft mouth coating tannin, and presented in an almost inky and glycerol liquid. The finish is long and bone dry with mounds of spice, purple fruit, and classic hunter valley charcoal – an almost shocking amount, like inhaling the ink from a pen and then sucking on a pencil for an hour – sorry for the vivid imagery – but this is a truly unique flavor that must be tried. However, for those who fear charcoal or extreme graphite, good news, after an hour or two the extreme nature of the charcoal tempers itself into an almost benign graphite experience. Unfortunately, this wine was lacking a label, in any way, so there is no photo to accompany these notes, but there is hope that this wine will find its way to our shores, though the exact date and details are still being hashed out. As I described above, this is a wine that will better suit the American palate. The floral and charcoal notes are tempered, but clearly still present, along with classical black pepper and black fruit styling. The nose on this black colored wine had a bit of manipulation and it shows with a more crystallized focus, showing heavy black pepper, black plum, spice, and floral notes. The mouth is super rich, extracted, and layered, with crazy and heavy mouth coating tannin, spice, blackberry, lovely charcoal, earth, and clear cedar notes that are just starting to come together, look for more cohesion in the next year or so. The finish is super spicy and long with clear oak influence and extraction, showing rich chocolate, leather, black fruit, and nice vanilla. The clear winner of the evening, though the wine was clearly manipulated with a bit of acid and SO2, I could care less on this one. The wine shows things that I can only compare to Jonathan’s Hajdu’s 2007 Brobdingnagian Syrah, a beast with a broad smile and happy feet. The nose on this wine is insane, intoxicating, and captivating. I actually just stood there happily and kept on smelling it while talking with both Richard and Michael B. The nose is complex and layered with ripe blackberry, ripe blueberry, black pepper, and raspberry liquor. The mouth on this insanely full bodied wine is like a bull in a china store however with fine control and precision. The mouth is massive and rich, layered and concentrated with ripe fruit, lovely mouth coating tannin, layers black and blue fruit, and lovely cedar that comes together into a round and balanced mouth. The finish is spicy and long with good fruit, balancing acid, leather hide, fantastic charcoal, and a finish of earth, chocolate, and watermelon. This is quite a tour de force and a wine that I would happily serve to my most picky and jaded wine aficionados. This is a wine that will be an eye opener for almost anyone. The wine is a blend of 40% Cabernet Sauvignon and 60% Merlot, with the Merlot fruit tempering the graphite intense Cabernet influence. The nose is a classic Bordeaux approach with blackberry, plum, raspberry, heavy graphite, and herb. The mouth shows heavy extraction and not yet integrated and somewhat aggressive tannin, along with black fruit, classic blackcurrant, luscious green and earthy notes that meld well with the tannin, acid, and cedar influence. The finish is long with more graphite that almost exaggerates the finish along with good spice and coats of leather. Posted on June 27, 2012, in Kosher Red Wine, Kosher White Wine, Kosher Wine, Wine, Wine Tasting and tagged 70 year old vine, Aziza's, Cabernet - Merlot, Chardonnay, Harkham Winery, Select, Shiraz. Bookmark the permalink. 6 Comments. The Aussie (very politely, I might add), sent me this blog post reviewing his wines. I agree that WineMusings did a much better job than I did on tasting notes- but his blog (to be fair) is all about wine!! 🙂 If my decsriptions didn’t woo you to natural wine, then check out this one. I really enjoy your story-like review. I have to agree with you 100% about Harkham Wines (although I might be a little bias being Richies brother). 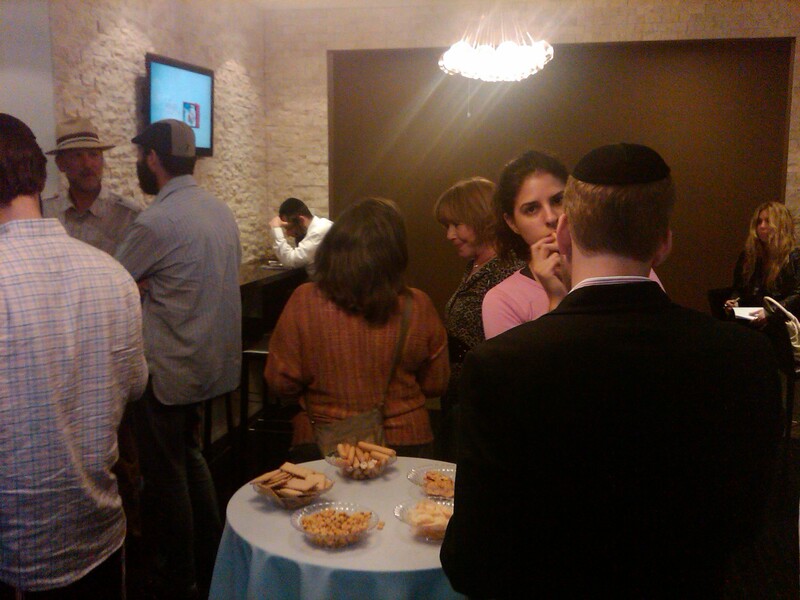 It’s really a major feat to create a kosher naked wine (natural no sulfur/preservatives). I personally really liked the 2010 Chardonnay, which is now finally available in the US. We should have the wines available early next year in the States! Check out http://www.vsimports.com to stay up to date on the arrival of the wines. Very, very excited!! !